For any woodwork hobbyist, enthusiasts, and professional, having access to the best woodworking tools is indispensable. In most cases, gaining access to the various woodworking tools means investing in your own tools. However, some of the professional woodworking tools prove to be quite expensive for nonproduction woodworking enthusiasts to purchase. Such machines are not easy to scale down to better suit small scale users. One very good example is the wide belt sander. As effective the wide belt sanders are, they are expensive for many woodworking enthusiasts and hobbyists to invest in. Nonetheless, the very best drum sander will be an effective alternative. Herein we will explore drum sanders intricately with the intention understanding all there is to understand about this machine. While the wide belt sander is considered as the best sander by both woodworking professionals and enthusiasts, many woodworkers have come to appreciate the true value of drum sanders owing to numerous benefits and advantages that the machine offers its users. One discernable advantage that a drum sander will accord its users is ease of dimensioning stock. For many woodworkers, the main purpose of the drum sanders is to dimension stocks. This feat is achieved using the coarse-grit paper. Drum sanders are capable of dimensioning various types of stock including doors, boards, and table tops which is quite beneficial if you work with a wide variety of delicate stocks. It should be noted that in carrying out his task, the machine does not affect the stock by causing any sort of damage to the stock such as chipping. Thus this machine tends to yield a high-quality finish during stock dimensioning. Additionally, fine finishing can be achieved quite easily by using a fine finishing grit in the drum sander. Another obvious advantage of using this machine is its versatility. The fact that you can dimension and fine finish your stock means that you do not need to invest your money to purchase different machines for the different functions. This is convenience makes drum sanders even more valuable. Finally, there is the price advantage. As mentioned before, drum sanders are a step down from the production oriented wide belt sanders. In being a step-down to the wide belt sander, it also cost cheaper, making the machine accessible from a financial view to woodworking enthusiasts. 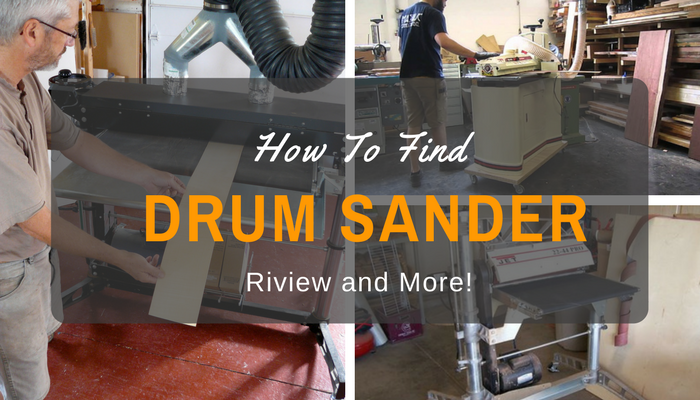 The vast majority of drum sanders prices range from $600 to $2,000. 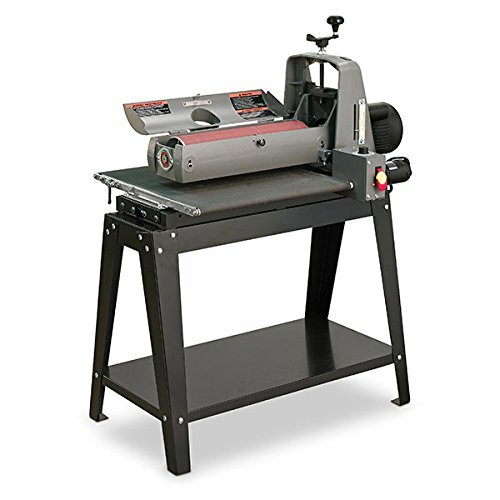 In between the price spectrum, is a wide array of different drum sanders for woodworkers to choose from. #1. Build Quality – The number one consideration to have in mind is the build quality of the sander. Even though drum sanders are cheaper than wide belt sanders, they still cost a considerable amount. It is thus important to ensure that you purchase a machine that will last a long time. To this end, ensure that you choose a sander with a sturdy build. Moreover, ensure that the qualities of alloys used are of the highest grade possible for drum sanders. Double-drum – A sander with two drums and twice as much sand paper to perform the task at hand, making it faster. Additionally, this configuration allows you to use two different grades of grit paper. Close-end Vs. Open-end – The closed-end version entails both ends being closed while the open end had one side open and the other closed. The closed end is generally stiffer and thus works at a faster rate while the open end is versatile and can accommodate twice the size of material than the closed versions. Dust collection feature that allows you to collect the dust emanating from sanding using a vacuum tank or cyclone dust collector. Variable feed rate to change the speed as needed, especially when working with sensitive materials. #3. Ease Of Use – Ultimately, the ease of use boils down to the overall design of the sander as well as the features it has. A sander with a considerable amount of features that are designed to make it easier to use the sander will make the for a pleasurable user experience. While this machine is versatile and can be used for dimensioning and sanding, it is best used to limited dimensioning and more of sanding. 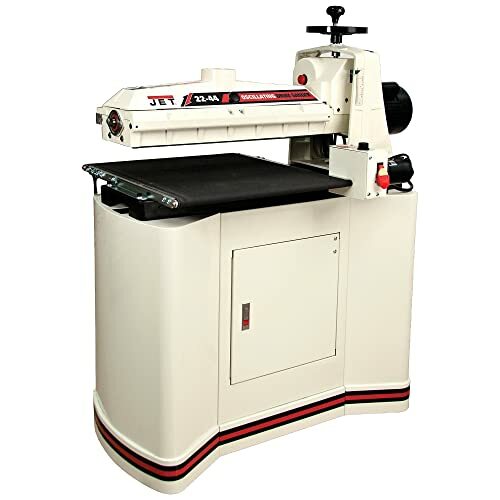 When dimensioning, drum sander can help you achieve extreme accurate dimension and when it comes to finishing, the drum sander has the capability of producing a high-quality finish. The JET 628900 Minis are designed for small scale use. The compact design, however, does not negate its ability to handle wide stocks as it is rated at 20 inches wide in capacity. The JET 628900 Mini is also powerful for its size; it sports a 1 horsepower motor that improves the speed of sanding. It also comes with a large wheel that makes it easy to adjust dimensioning requirements and a quick paper change mechanism. These two elements make it user-friendly. 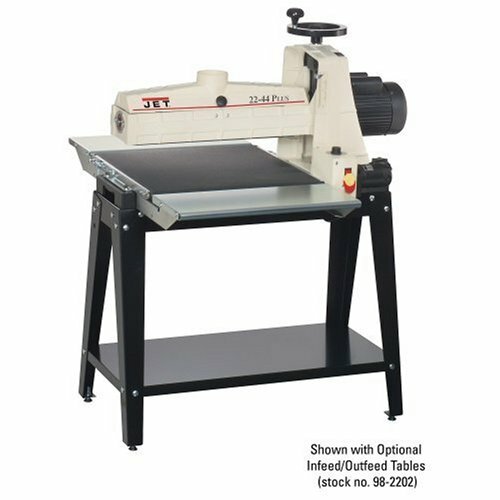 It has a compact design that bodes well with woodworking enthusiasts with limited space in their workshops. It is has a powerful motor that makes it easy to sand a large number of stocks in a short amount of time. The variability of the drum speed gives this compact drum sander the ability to vary the sanding speed as needed. It is designed and made of high-quality metals that give it extraordinary durability. 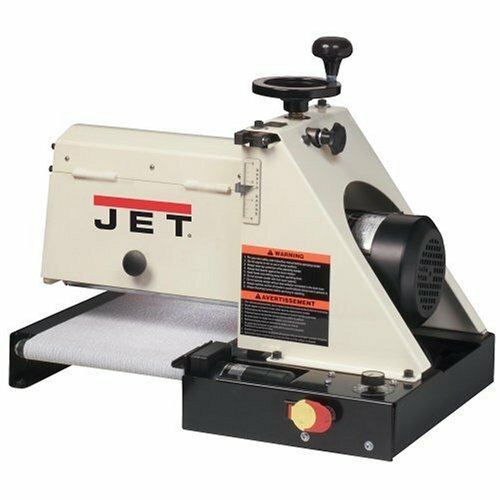 The simplistic design of the JET 628900 Mini means that it is not at risk of failure due part-system failing, as may be the case with other robust drum sanders. The JET 628900 Mini is not powered enough to carry out rough works. As such, the use of this particular drum sander should be restricted to light sanding. It is super difficult to carry out paper change on this sander. It takes some getting used to in order to become efficient at changing papers. It also has a design flaw. The vast majority of the drum's weight is supported by a single spindle screw. This makes is susceptible to critical failure. The unit comes as a whole. This is beneficial for individuals looking for a complete unit without the need to scour the tools market for additional pieces to add to the machine. It comes with advanced features designed to improve the quality of finish that it yields on the stock. The oscillating feature which negates heat buildup comes in handy in ensuring a high-quality finish. It has an effective dust collection system. At 4 inches, the dust port is quite efficient in sucking dust. With 1-3/4 horsepower, the 22-44OSC is powerful compared to other sanders in the market. This means that it works efficiently sanding and removing stock. As good as the 22-44OSC is its users tend to be critical of the process of changing sandpaper. The fact that it is difficult to change sandpapers takes away some of the pleasure of using the sander. The oscillating function can also be problematic to use with some workpieces, especially those that have a small thickness. The JET 649004K is designed to sport just enough amount of drum sander technology to improve the experience of sanding without putting the sander at risk of critical failure from having too many complex technologies. It powered by a 1-3/4 TEFC motor to improve the rate of sock removal while negating dust infiltration. It has JET's SmartSand control that reducing the load on the drum, thereby negating the overheating of the sandpaper and the subsequent burning of stock. ​More importantly, the JET 649004K is inherently designed to be easy to use. For instance, changing of sandpaper is quite easy and straight forward. Additionally, the entire machine is designed for easy setup. It has JET's patented abrasive take-up fasteners which make the process of changing sandpaper easy and fast. It is made of heavy duty alloys and metals, thus improving its longevity. It has SmartSander technology that negates overheating of the sandpaper and the associated stock burning. Its users might find it difficult to sand wide and thick workpieces. The does not come with the infeed and outfeed tables, as they are optional. As such, you have to spend extra money to get the whole setup. The SuperMax is designed from the start to solve many of the problems that other drum sander some with. It is feature rich and incorporates ground breaking technology that makes the experience of using this drum sander quite pleasant. It comes with an extra wide conveyor belt to improve the handing of extra wide stock (workpieces wider than 19 inches). It also has a robust alignment feature that makes it easy and fast to adjust the alignment to the conveyor belt sanding head. The indexed alignment further improves the sanding of extra wide stock achieving smooth finishes. But perhaps it is the INTELLISAND Technology that set the SuperMax 19-38 from other drum sanders. The sensor automatically adjusts the speed of the conveyor based on load and the amount of sanding required, further negating the potential of stock burning, damaging, and gouging. Finally, the conveyor is designed to have super grip, enhancing the sanding experience. Furthermore, the super grip allows users to sand very thin workpieces. It is super quiet both when sanding and when idle. This makes the SuperMax 19-38 perfect for use in confined spaces. It comes with a durable heavy duty stand which is more than capable of withstanding any vibration that emanates from the drum unit. The inbuilt INTELLISAND Technology – a load sensing system - improves the quality of finish. By adjusting the speed of the conveyor belt to suit the dimensioning need, it prevents gouging, burning, and damaging of stock. One obvious demerit of this drum sander is that the infeed and the outfeed tables do not come with the sander. As such, you have to purchase them separately if you're your sander must have one. This may increase the cost of purchasing this particular drum sander. Another con that comes with this particular machine is that is somewhat more difficult to load the sandpaper, which may make the whole experience of using the machine unpleasant. In conclusions, as far as woodworking tools go, having a drum sander is a good idea for individuals looking to improve the efficiency in woodworking. However, as it is with every other kind of woodworking tool, only the best drum sander suffices. In this case, the SuperMax 19-38 Drum Sander is sander of choice. It is a good choice as it has advanced technology that makes sanding inherently easier and more automated, while never compromising on the quality of finish. Furthermore, the SuperMax 19-38 being an open-end drum sander give it the versatility needed to work on both compact stocks as well as wide socks.